Photo and comments courtesy of E.V. "I have been carrying the MF0 T for a while now and am totally impressed with it! While it may not be perfect, it is a great EDC knife. It is compliant with the 3.5” blade length that is legal to carry here in Nebraska. Actually a bit under so should have no problems with the law. Having carried this one for a while it helps to appreciate the design effort Extrema Ratio put into this knife. It is like all ERs that I have (I have quite a few) very solid and very well made. No compromise in that area. Like most ERs first impressions leave you wondering about some of the features. It is when you use the knife, that the features like the choil (as seen being used in the picture) show off how well thought out and useful this knife really is. 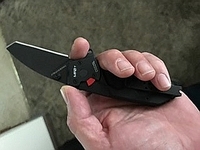 The flipper on the blade does look a bit funky at first, but actually works very well and works as a guard or place to anchor your fingers when using the knife hard. That part does help as this knife is not large and while my hands are not huge, it does seem sort of small. It is easy to carry with its size, yet still easy to use with large hands. I suppose I could go on, but the bottom line is, you really can’t do better than this knife If you’re looking for a compact EDC that will act like a big blade"